The Cape Town Water Map used the notion of social recognition to nudge Capetonians towards more pro-social water-saving behaviour, as the drought crisis peaked in January 2018. In January 2018, Cape Town came within three months of initiating ‘Day Zero’, the day when emergency rationing measures would kick in, and city utility managers would shut off water to homes in the suburbs, and to businesses outside of the city centre. That same month, the city launched the Cape Town Water Map, an online tool that uses the notion of social recognition to encourage people to be more water-wise. Behavioural economists from the University of Cape Town (UCT) helped design this tool, and also drew up other ‘green nudging’ experiments through the course of the drought, to get people to act in a more pro-social way. The lessons learned from this process are relevant to municipalities across the subcontinent, particularly as they grapple with managing scarce resources in an increasingly unpredictable climate. In the summer of 2015, long before anyone knew that a drought was setting in, or that it would stretch to nearly three years and be the worst in over a century of record-keeping in Cape Town, a team of behavioural economists here was about to run an experiment to see if they could subtly influence Capetonians to be more water-wise. The ‘green nudging’ experiment involved sending a series of simple, positively-worded messages to households in their monthly utility bills. Over the course of six months, researchers sent these out to 400 000 households across different income brackets. They sent out nine different messages, posting these to various groups of households. Some messages used clear graphics to explain the complicated tiered block-tariff water pricing system, and showed people how much money they’d save if they cut their water use, or how much it’d cost them if they didn’t. Some messages gave tips on how to save water. Other messages used the notion of social recognition to urge people to act in a more pro-social way: the messages either showed people how their household’s water use compared with the average for the neighbourhood; another promised to recognise a person’s water-saving efforts by publishing their name on the city’s website. Once the six-month experiment had run its course, Professor Marine Visser and her team at the Environmental Policy Research Unit at UCT’s School of Economics were able to track how these different households responded to the individual messages. But the researchers continued monitoring water use once the experiment was done, and as the drought unfolded. They were then able to compare the findings from their ‘behavioural nudging’ interventions, with how people responded to other efforts by the city to encourage water-saving behaviour. As the drought intensified, the city first increased the price of water, then brought in ever tighter water restrictions, as well as fines for those who flouted restrictions. At one point, it sent reprimanding letters to households that were using more than 50 kilolitres of water per month, and threatened them with the installation of water cut-off devices. Then, by the height of the drought, it released its Critical Water Shortages Disaster Plan. This proved the most effective intervention of all: Capetonians’ water use dropped drastically, in the single biggest water saving drive of the entire drought. Then, in January 2018, the city announced that Day Zero was just three months away. In the end, this emergency rationing measure wasn’t needed. The city was able to stretch the last reserves of water until winter rains returned again in June 2018. Through tracking Capetonians behaviour responses during the drought, the economists have drawn up some important lessons, starting with one of the key findings of the behavioural nudging experiment: that social recognition can be a powerful motivator for behaviour change in the interests of the common good. Of all the nine ‘green nudging’ messages send to the 400 000 targeted households, the one that got the most positive response from the biggest water uses - the wealthier households - was the one that promised to reward water-wise behaviour through publishing people’s names on the city’s website. As Cape Town’s dams started to run critically low towards the end of 2017, the EPRU team worked with the city to draw up another tool, also based on the positive behaviour changes that came with the social recognition interventions from the nudging experiment, in the hope that this could drive even greater water savings across the city. The result was the Cape Town Water Map, a digital tool that flagged households that were sticking to within the city’s recommended monthly water targets. The online tool placed light green dots over free-standing homes who used 6 kilolitres (kl) of water or less per month. Households whose water use fell between 6 kl and 10.5 kl per month got a dark green dot. The map also showed how people’s water use compared with their neighbours’, and how one suburb’s use compared with another’s. The map designers were deliberate about recognising pro-social behaviour, rather than naming-and-shaming those who were using too much water. The map went live on 15 January 2018, close to when the city announced that ‘Day Zero’ was just three months away. Because of the speed of rollout and the severity of the water crisis, the city decided to prioritise the impact of the tool as a water saving intervention, rather than focus on rigorously tracking the behaviour responses to it. 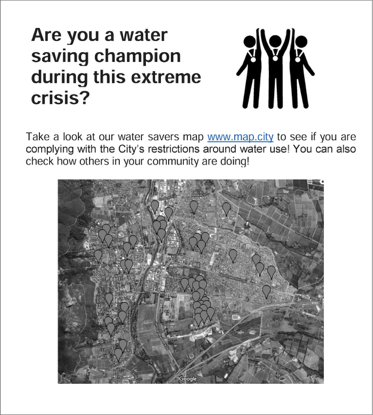 This meant that the EPRU researchers weren’t able to directly measure the map’s impact on nudging water use behaviour. But the municipality was able to record web traffic to the online map, and measure the social response it got by tracking commentary on the map through conventional and social media. These, they say, indicate that Capetonians engaged with the map extensively. It was controversial, though: some residents praised it, others criticised it, but it got plenty of airtime in local media. Researchers published an article about the City of Cape Town Water Map in the Journal of American Water Works Association.